... but would miss if it wasn't there. The big tree is a survivor and enduring. Imagine some 200 years ago a small seed landed in the soil of what then must have been a muddy road. Not even know as Albert Street. 2" 3" 6" tall squashed under boots and cart wheels. Growing ever taller the sapling must have stood steadfast as young boys sped past with hoops and young women with prams men with horses and eventually bicycles. Fortunately by the time the car came along it was big enough to be avoided. How did it manage not to be just broken as a twig in it's early days. It even managed to survive the council workers attempts to get rid of it in the late 1980's (date unknown). OH Yes the Big tree is a survivor alright. And it will probably be there long after I'm in the ground. Found it! picture #598 shows the high wall around the garden with the tree inside. I think there were 8 trees planted at the same time in this garden. I thought the big tree was the lone survivor of a group of trees planted in the high walled garden of a house that stood on the street - garden now long gone. I think there is a picture of this walled garden somewhere in this image library? Photographic history tells us that The Big Tree is indeed very old, I refer to Orkney Archives picture #598 Albert Street Kirkwall in the olden times. The tree was enclosed in what was possibly a private garden at that time, which would account for the length of time it has lasted. According to the Autobiography of Samuel Laing of Papdale who was born in the house behind and above Christine Clark's in 1780, the trees were planted by his father Robert Laing of Strenzie who bought the house in 1760 and died in 1803. 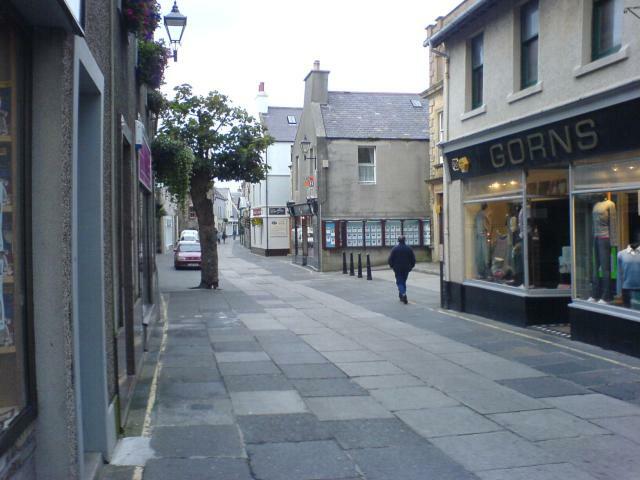 There were three trees, two of which were cut down when the present shops were built and the street widened in about 1875 (see Ernest Marwick's article reprinted in "An Orkney Anthology" pp 463-7). Thank you all for the info on the origins of the big tree. I was sitting here musing when my comment was created. In fact I now recall the picture 598. As an incomer albeit along time ago, I find Orkney history fascinating.